Early Spring growth of an established purple passionflower plant. Note tendrils growing from leaf axils. Purple passionflower has long trailing, non-twining, mostly unbranched stems that grow rapidly and can reach 20 feet in length. Growth habit is a combination of climbing and sprawling. Tendrils and/or flowers at leaf axils grow at the same time as when the leaves first form. Tendrils, four or more inches long, grow in random directions away from the leaf while flowers grow skyward. Plant are generally glabrous (without hairs) to occasionally finely hairy, especially on young stems; immature ovaries are densely, velvety hairy. A fresh flower with typical coloration. Flowers may be more white or more purple. Note the ovary immediately below the three styles but above the five stamens. Widely spaced, three-lobed alternate leaves, on petioles that are short in comparison to blades, are dark green above and light green below. Leaves have short, closely spaced rounded teeth with broadly rounded, deeply cut lobes that are acutely pointed. Major veins, at the center of each lobe, extend from petiole to tips of lobes. Veins of the two side lobes are about 50o off the central vein. Leaf blades, about four inches long and five inches wide, may lie flat or be slightly folded along the three major veins. A pair of raised, oval glands are found on the petiole just below the leaf blade. On this healthy specimen, day-to-day succession from bud to flower to developing fruit as well as raised glands on the petioles (just below leaf blade) can be seen. Flower buds, elongated and squeezable, consist of five somewhat leafy sepals with each having a central sharp ridge which terminates with a prominent soft “spine”. These spines encircle an open area at the top of the bud. Showy flowers, occurring singly, are two and a half inches wide. The perianth (portion of flower below reproductive portion) consists of five sepals, five petals and a corona made up of long, round filaments that are crinkly near the ends. Perianth and reproductive portions of a fresh flower are reflexed downward; however, the perianth reflexes upward after fertilization. 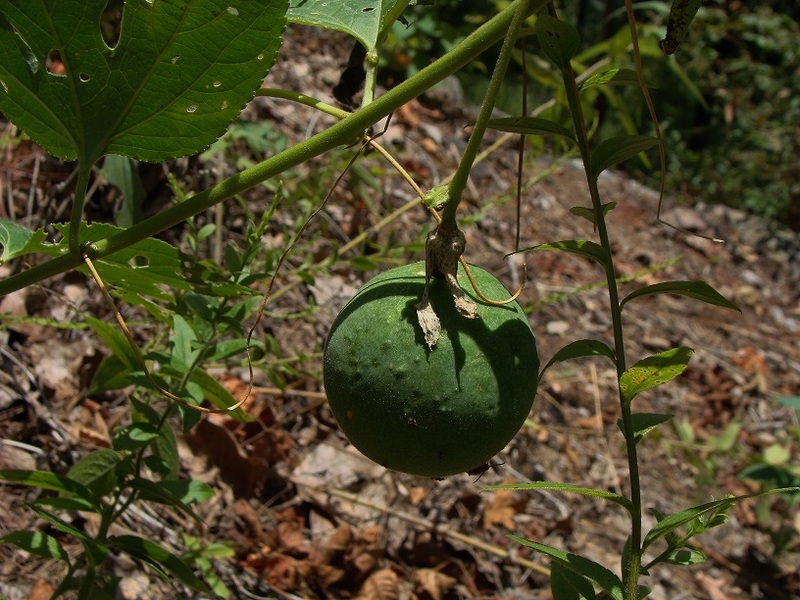 A maturing fruit of purple passionflower, which will become yellow and dry at maturity. Note dried sepals still attached. The color of the petals, patterned in white and purple, and the color of the inside of the sepals generally mirrors that of the corona. Five stamens with large anthers and a pistil of three styles and stigmas are elevated above the corona with the ovary in between (superior position). The pollen bearing side of the anthers hangs down in the space between the corona and styles so that pollination is performed by large bees rummaging about for nectar. 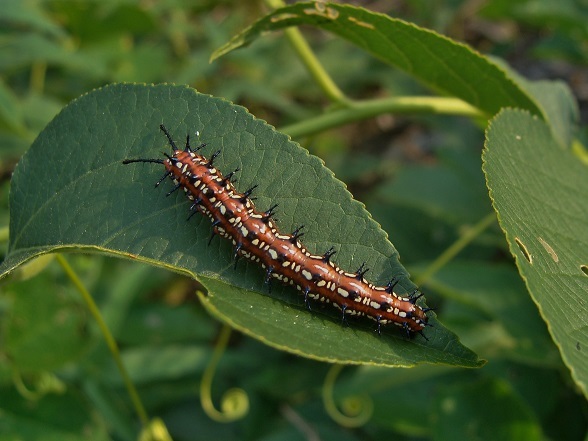 Variegated Fritillary caterpillar on purple passionflower leaf. Ovaries of fertilized flowers develop quickly into two-inch, egg-shaped to rounded fleshy fruits on long petioles. The green fruit contains 100± seeds with each seed individually surrounded by a membrane containing a viscous, edible (and tasty) material. With maturity, the fruit becomes yellowish and dries to a crispy outside skin. Dark brown seeds, about 0.25” long and half as wide, have smooth edges and sides that are randomly, but densely pock-marked (as result of ridges encircling lower space). 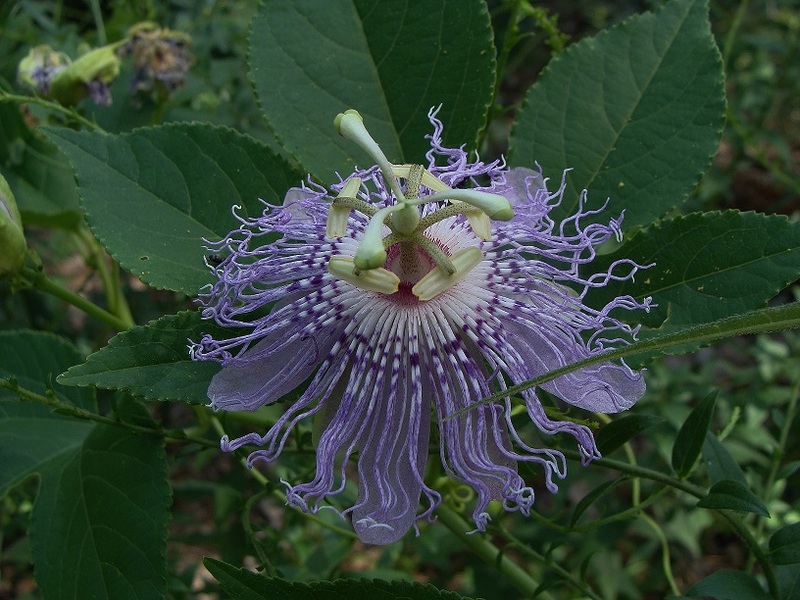 Purple passionflower can be a great addition to a native garden or retained in a natural setting. 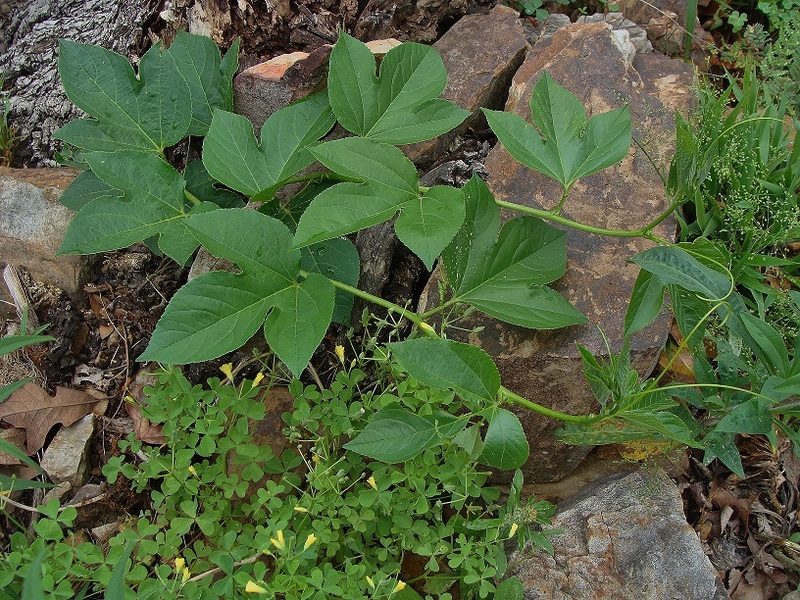 However, its clambering growth habit and its habit of popping up in inconvenient places may be drawbacks to a more formal setting (stems can be easily pulled off roots, though, for control). In especially droughty conditions, the plant may shrivel and go dormant early, but returns the following year. 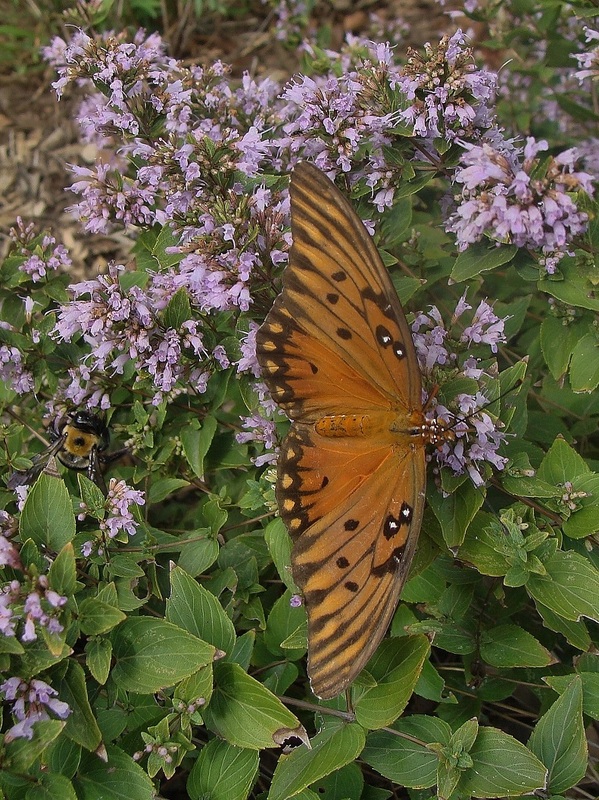 Purple passionflower is an important larval host plant for the Gulf Fritillary and Variegated Fritillary. “Passionflower,” named by 16th century Spanish missionaries who related flower parts to Christ’s crucifixion or the “Passion of Christ.” Namely, 1) Five sepals and five petals represent the disciples, excluding Peter and Judas, 2) Five stamens represent five wounds, 3) Three styles represent three nails, and 4) Corona represents crown of thorns. 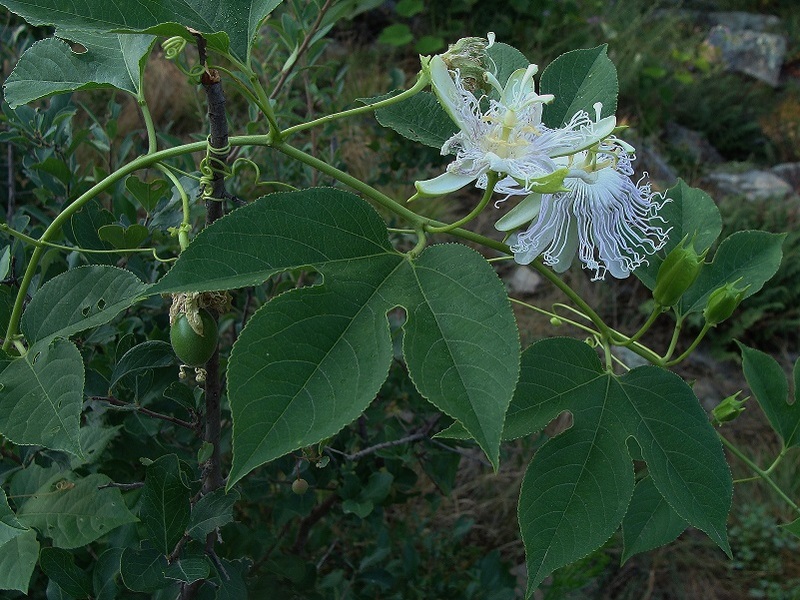 “Maypop” may derive from the plant’s growth habit of “popping up” in unexpected places in spring or that the fruit “may pop” when stepped on. 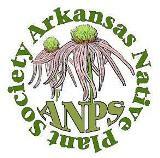 This entry was posted in Know Your Natives, Native Plants, Vines, Wildflowers and tagged Passiflora, Passiflora incarnata, Passifloraceae, Passionflower, Purple passionflower. Bookmark the permalink.